FISHING SCOTLAND HAS TO OFFER. and most exclusive salmon rivers, whether that be guided or unguided. a variety of accommodation, transportation and catering options. most exciting challenge in Scottish salmon fishing history? Our expert fishing guides will get you face to face with the king of fish. We can also provide tackle hire if required, so you can travel light. We at Salmon Fishing Holidays Scotland specialise in designing bespoke Scottish salmon fishing holidays and experiences that are tailor made to suit your requirements. Our highly knowledgeable team, has over thirty-five years experience, of salmon fishing in Scotland which they use to make sure that you get the most from your Scottish salmon fishing holiday. Whether you are looking for a single day’s guided salmon fishing, a short break or even a week-long luxury salmon fishing holiday, we have it covered. We also arrange corporate salmon fishing experiences across Scotland which have proved to be very popular for that special day away from the office. 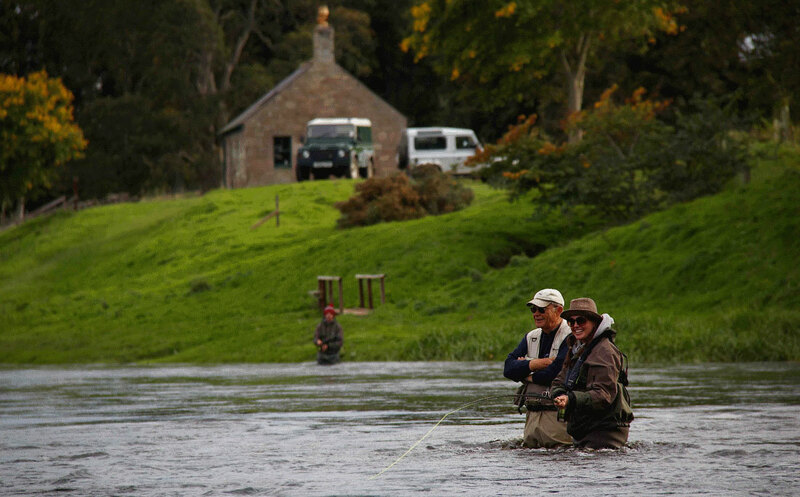 Through our selected partners, we have salmon fishing available on the some of the most exclusive rivers in Scotland, from the small intimate streams of the Scottish Highlands to the larger more famous rivers like the Dee, Spey and Tay. For the visiting salmon angler, we offer a plethora of choice when it comes to the different salmon fishing locations around Scotland. All the beats that we use are private and offer the ultimate relaxation and solitude for our clients. In addition to the wide array of salmon fishing locations, we also have a variety of accommodation options to suit all tastes and budgets. Whether you are looking for a simple Bed & Breakfast, boutique hotel, luxury self-catering lodge on the banks of the river or even a Scottish castle, the choice is yours. We also offer a wide range of transport options, so when you arrive in Scotland to begin your exclusive salmon fishing holiday, you can just sit back, relax and enjoy a stress-free experience. The Salmon Fishing Holidays Scotland team can arrange car hire or private transfers by car or air. Why not take advantage of our exclusive “Arrive & No Drive” service? This service takes care of all your transportation needs once you arrive in Scotland. We all know how important it is to have local knowledge when you come salmon fishing to a new country. Salmon Fishing Holidays Scotland has been lucky enough to assemble a world class guiding team. We have local as well as Scandinavian guides. We are also the only of the company in Scotland to offer the services of a female guide. The knowledge and experience of our guiding team is second to none and they will ensure that you get the most from your Scottish salmon fishing holiday. We at Salmon Fishing Holidays Scotland understand how inconvenient it can be to have to transport your fishing luggage across continents to your chosen fishing destination. We therefore offer a comprehensive tackle hire service which includes top quality salmon rods, reels, lines, waders and life jackets, so that this is one thing less for you to worry about. We can also provide you and your party with riverside catering including lunches, BBQs and decadent afternoon teas, so all you need to do is to concentrate on hooking the next salmon. In addition to salmon fishing, we also offer other activities such as, Trout fishing on an exclusive Scottish loch set on a stunning private estate, as well as grayling and pike fishing during the season. If there are non-fishers in your party, we can arrange stalking, shooting, private sightseeing and whisky tours or even a round of golf, if you prefer. Our promise at Salmon Fishing Holidays Scotland is to provide you with excellent customer service and design a holiday that will suit your requirements and budget. We will aim to arrange salmon fishing on the most productive rivers in the country, depending on the time of year you are planning to come to Scotland. This will give you the best chance of making contact with that hard-fighting Scottish salmon. At Salmon Fishing Holidays Scotland, we pride ourselves in making your Scottish salmon fishing dreams a reality! Prove your not a bot. What is 26 + 22?